I didn’t know John Colburn or his work, when Coffee House Press’s Chris Fischbach recommended him to my project. I still can’t claim to “know” John, but I know you should listen to him. His poem for the 7th Street Entry is on the shorter side, at 2 1/2 minutes, but is entrancing, kind, and somehow sad, too. I encourage you to go and listen to “The Entry” outside by the iconic starry wall, preferably some evening when a line of concern-goers curls around the building. Or go when the concert has started, and the handful of smokers stand outside getting their fix. Or late, after the show is finished, while the headliner from 1st Ave is packing up a bus around the corner. There is something timeless, personal, and magical in this poem. It reminds me of all of the times of day and night I’ve wandered downtown, past that wall, how many of the stars’ bands I’ve seen on that stage. For a poem as short as John’s is, it is also enormous- it encompasses something bigger than itself. 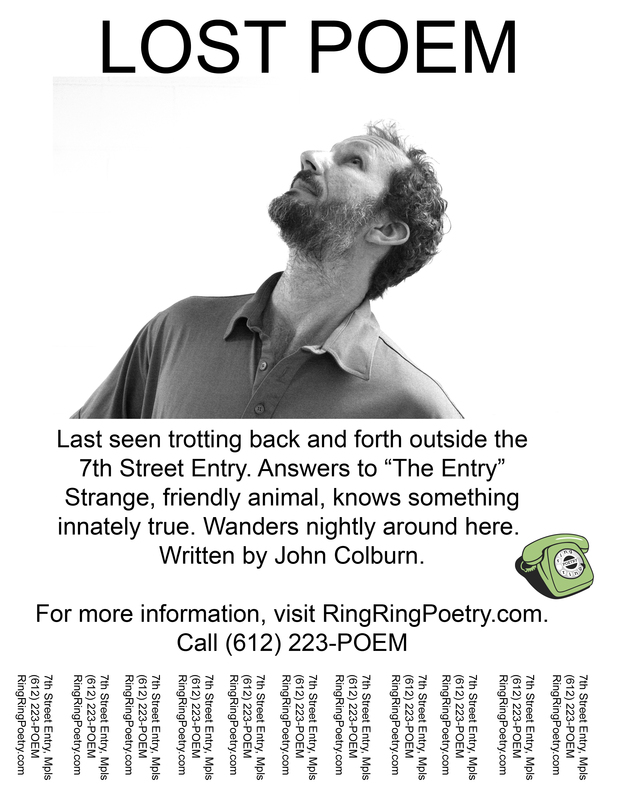 Meet me outside of the 7th Street entry at 3am some night this week, dial 612 223-POEM, and explore John Colburn’s poem with me. John Colburn is originally from Mantorville, MN, and is an editor and co-publisher for Spout Press. His book Invisible Daughter is available from firthFORTH books and a second book, Psychedelic Norway, is forthcoming from Coffee House Press in 2013. With his wife, Sarah Fox, he tends The Center for Visionary Poetics in Minneapolis and he is also a member of the improvised music collective Astronaut Cooper’s Parade.